I spent a great day yesterday (Saturday, 29 May) visiting a variety of parks in Orange County and Rockland County in downstate New York with a fellow Queens birder, Seth, and a Rockland County birder, Gene. Though, really, to call either of them “birder” doesn’t give a complete picture of what they are about considering the diverse array of life forms that pique their interest. Over the course of the day we looked at birds and plants and dragonflies and reptiles and mammals and butterflies and amphibians and more but a single blog post could not contain the images I got of all of those things. 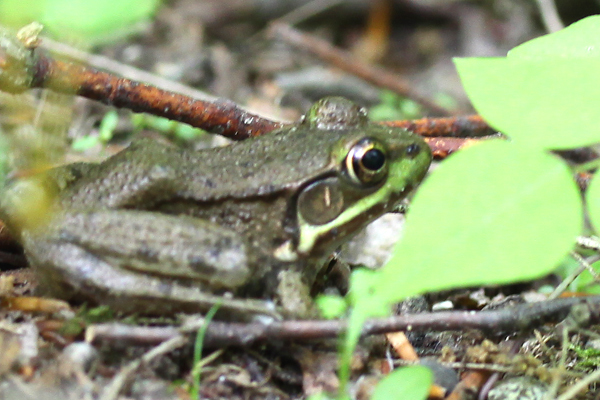 This post, therefore, is focused on just herps, that is, amphibians and reptiles…and just the ones of which I got decent images. 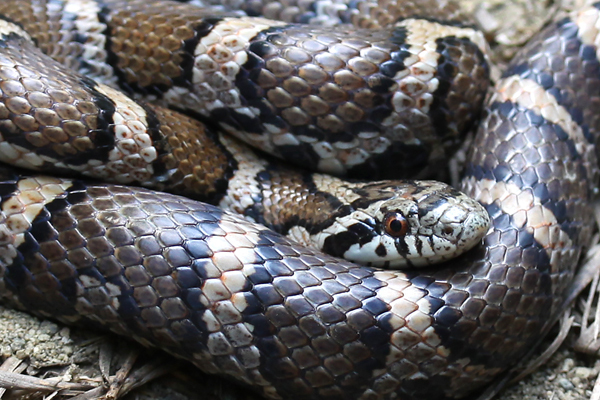 Both shots above are of a Milk Snake Lampropeltis triangulum. 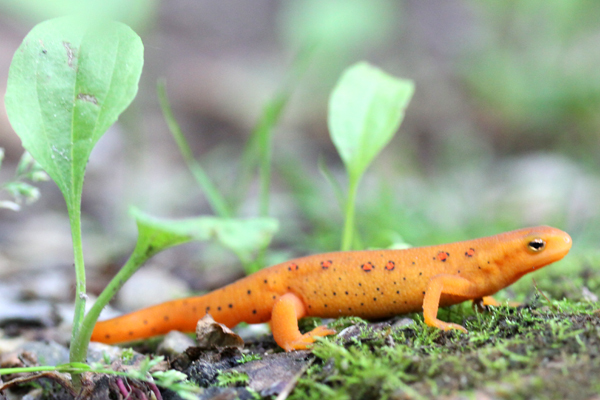 The shots above are of Eastern Newts Notophthalmus viridescens in the Red Eft phase of their lives. 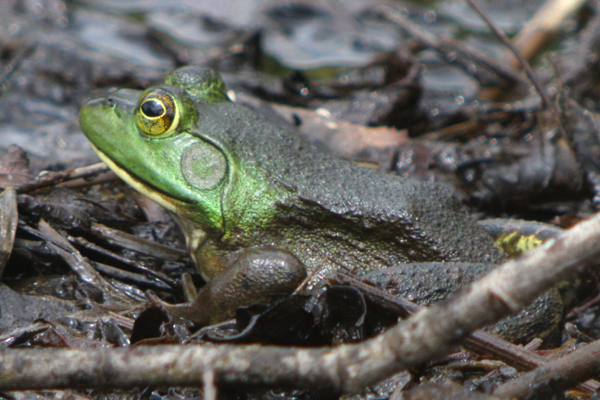 American Bullfrog Rana catesbeiana is above and Green Frog Rana clamitans is below; they are two of four frog species we heard or saw for the day. 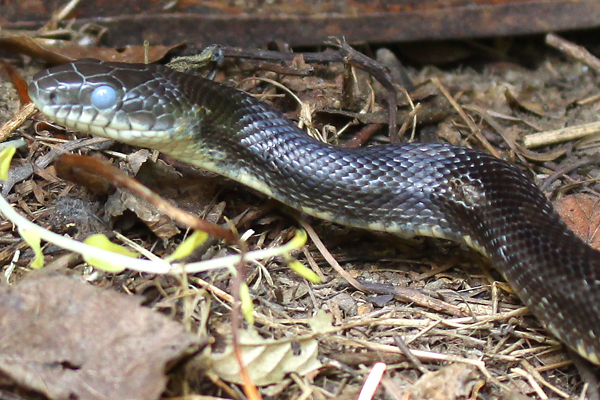 Below is an about-to-shed Black Rat Snake Elaphe obsoleta (note the blue eye) followed by two shots of my first-ever Timber Rattlesnake Crotalus horridus. Many thanks to Seth and Gene for sharing their knowledge and company on what was an outstanding outing across two counties. I learned a ton, saw a bunch, and had a great time! So, exactly, how close did you get to the rattler? I was within a three or four feet, but the snake was a bit less then two feet long itself. They are a lot less dangerous than people give them credit for, though, of course, people shouldn’t try to pick them up or anything. I am so jealous of that horridus. I still haven’t managed to find one. Nice show! Thanks for sharing. Hey cool pics. Name is Lamar i live in the bronx and also love birds and reptiles. There is a few places within the city to see snakes and birds. We should hook up and go birding and herping.